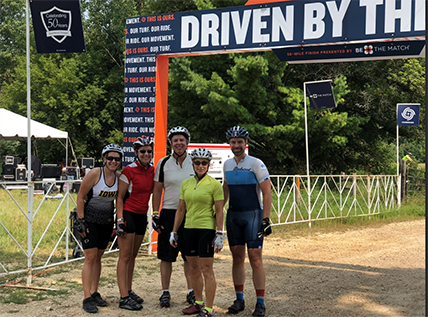 Congratulations to Merchant & Gould’s team that participated in the 2nd annual Chainbreaker charity bike ride on Aug. 10, in support of life-saving cancer research at the University of Minnesota’s Masonic Cancer Center. The ride started in Eagan, MN and proceeded southwest to Welch to conclude the 50-mile route. The two-day 180-mile route headed west with an overnight in the dorms at St. Olaf College, and concluded in Excelsior. M&G’s team included Dan McDonald, Laura Hupp, Alex Christian, Heather Kroona, and Ben Tramm. As a final highlight of the event was, Ben had the honor of escorting a cancer survivor across the finish line as the first two riders to complete the full 180-mile route. If you would like to support our team and contribute to life-saving cancer research, please click here to contribute. And, let us know if you would like to ride with us next year!